In honor of the start of summer in Maine (and in acknowledgement of the fact that it’s felt like summer in Georgia for about a month), I whipped out my Maine Summers Cookbook and began my search for the right recipe. 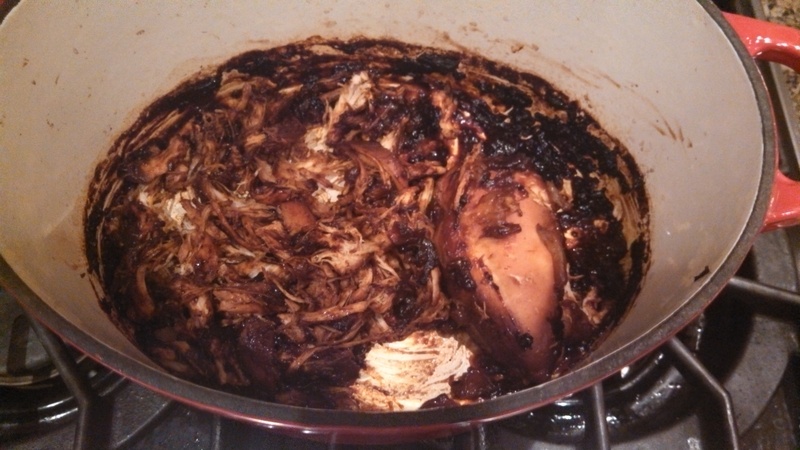 When I stumbled across “Pulled barbecued chicken with vidalia onions,” I knew it was the winner. 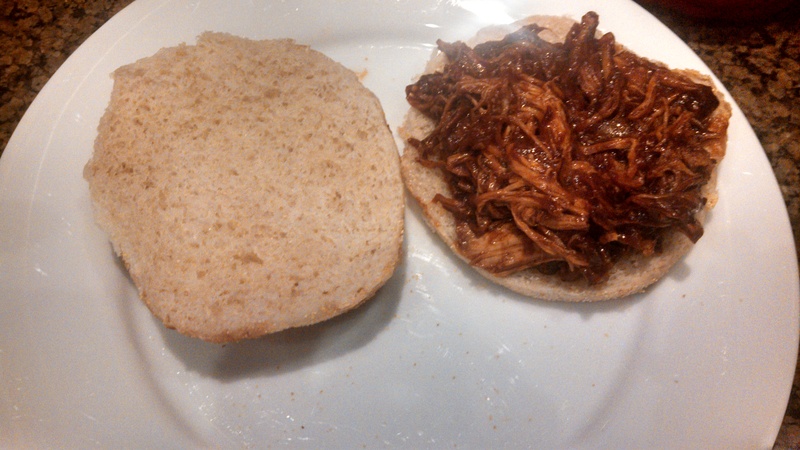 We’d recently been treated to a delicious, slow cooker version of pulled barbecue chicken while at a friend’s home over Mother’s Day weekend. I hope to get a copy of their recipe, as well, but was thrilled to stumble across one of my own. In addition, the vidalia onions honor our new Georgia home (check out Vidalia, GA, “The Sweet Onion City”). You could easily transfer this recipe to a slow cooker, I believe. It takes about 6 hours in an oven heated at approximately 250 degrees. The recipe below serves 8 – I made a smaller version, between 1/3 to 1/2, but wasn’t precise enough with my measurements to share it. The good news is, even if you don’t have the balance of ingredients exactly right, it still tastes great! Preheat the oven to 250 – 300 degrees. Place the chicken and onions in a large Dutch oven. In a separate sauce pan, combine the chicken broth, ketchup, brown sugar, garlic, cider vinegar, hot sauce, and cola over medium heat, stirring until well blended and the brown sugar is dissolved. Pour the mixture over the chicken and onions. Put a lid on the Dutch oven and bake in the center at very low heat for 6 hours (I reduced the heat to about 200, 225 at this point). Check the chicken for doneness – it should be falling apart. Pull the chicken pieces to shreds using two forks until all meat is torn apart. Partially pulled! Be aware, the sauce starts off red and liquidy – it boils down to this nice, dark, barbecue sauce look. Recommended serving is with warm roles and cole slaw. I had the initial taste last night, while my husband attended a work dinner, and skipped the side dishes entirely. Tonight, we’ll have the rest, and I plan to serve it with green beans and Ben’s Peppery Potato Wedges – another great recipe from the Maine Summers Cookbook. Categories: Eat, Weekly Recipe | Tags: barbecue, Maine Summers Cookbook, pulled chicken, recipe, slow cooking | Permalink. Dear readers, I’m hopeful that my blogging hiatus has now come to an end. As I type, I’m sitting, at long last, on our couch in our new home. It’s only new to us – it was built in 1955 and renovated in 2007 – and we love the combination of character with modern amenities. And… best of all (okay, perhaps not of all, but best for this blog)… it’s a house that is hooked up to the internet! I’m not going to drone on about the features of our new home that I love, although there are many. I’m just thrilled to be writing to you again (and the forthcoming weekly recipes will have the benefit of being cooked on a gas stove!). Today’s post is a brief preparation for the upcoming Memorial Day holiday weekend – now just a few days away. It’s the official start of summer in Maine (or, perhaps I should say “summer” – as any Mainah knows that late May and early June rarely qualify as summery), and the kick off to the busy tourist season. This important holiday is a time for us to recognize and honor those who have given their lives for our freedoms and this great country. First, let’s give thanks for our heroes and their sacrifices. There are many parades to choose from in southern Maine – to list just a few: Portland’s begins at 10:30am in Longfellow Square, and concludes at Monument Square; Cape Elizabeth’s begins at 9am on Ocean House Road, and goes to the War Veterans Memorial next to Pond Cove School; Freeport begins at 9:30am at the high school and proceeds to the town park, with the ceremony at 10am; Kennebunkport also begins at 9:30am at Masonic Hall on Temple Street, ending at Dock Square; and Gorham begins at 11am at Village School, concluding at Eastern Cemetery. Mainetoday.com offers up a full list of 10 things to do this weekend in Maine – check it out! And, if your entertainment is of the private, family gathering variety, please stay tuned for a weekly recipe post coming your way tomorrow… a pulled barbecue chicken dish that is easy, delicious, and seems like a pretty darn perfect holiday dish! Happy Memorial Day in advance! For my holiday, I’ll once again be returning to scenic Jekyll Island, GA and enjoying the sea and the sun. Categories: Drink, Eat, Holidays, Play | Tags: Coastal Maine Botanical Gardens, Maine, Memorial Day weekend, parades | Permalink.